PORTLAND, Maine — The city has elected a new mayor. With 51 percent of the vote, Ethan Strimling, a former legislator and director of a social service agency, claimed victory over the city's first elected mayor, incumbent Michael Brennan, and Green Independent party leader Tom MacMillan. Strimling told supporters Tuesday night his campaign put a lot of energy into listening and building as broad a coalition as possible. He says he has been asked how he'll be able to please such competing interests. "The simple answer, of course, is that I won't please everyone," he says. "I can't. No one can. But the simple promise I did make to every single group and every individual I met with is that you will have a voice at the table. You won't get everything you want, but I promise you will be heard and I hope you will feel that your input mattered." Strimling says the No. 1 issue facing the city of Portland is affordability. He says Portland is heading toward becoming like Boston, with haves and have-nots — those looking for services. Strimling says Portland isn't there yet and that his primary focus is trying to determine how to keep Portland affordable and livable. "You know since 2011 our property taxes have gone up about 15 percent, rent went up 17 percent last year and our incomes dropped by $700," he says. "That's not sustainable. That is trending toward a city like Boston." 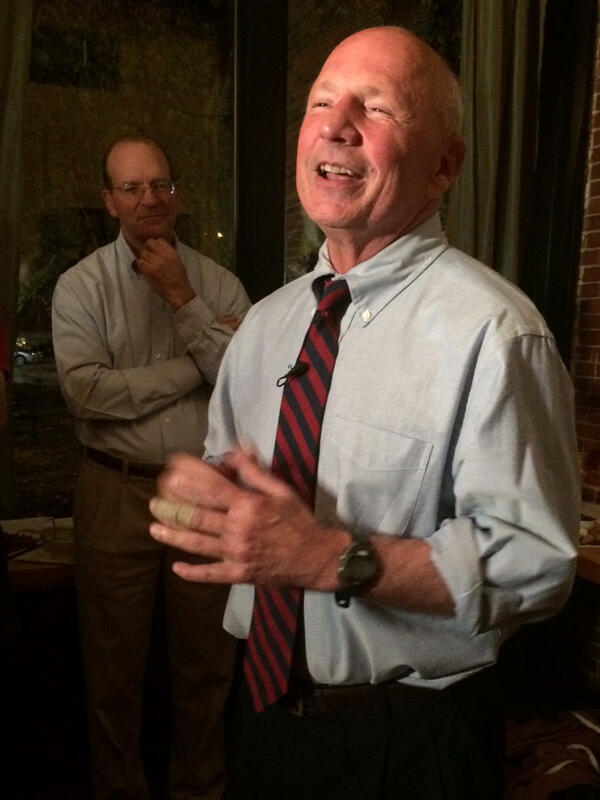 Michael Brennan gathered with his supporters at a restaurant in downtown Portland on Tuesday night. Shortly after conceding to Strimling, Brennan gave a speech thanking his supporters and looking back on his four years. "The simple fact of the matter is, we had a great four years — I had a great four years," he says. "Being mayor of the City of Portland was a tremendous honor. We accomplished a lot. First in the City's history, first in the state's history, of minimum wage. We made sure that 800 of our neighbors, friends, and people from other countries were not homeless and without food. And when necessary, and when appropriate, and often, we stood up to the governor and told him that what he believed in is not what we believe in here in Portland. "There is nothing that I look back on with regret," Brennan says. "I'm very optimistic and hopeful about the future and I wish Ethan the best of luck. I'm very excited about the future of the city of Portland." Democratic state Sen. Justin Alfond, whose 8th District represents much of Portland, was at Brennan's gathering. Alfond says he will work with new Mayor Ethan Strimling and that Brennan has accomplished a lot in his four years as mayor of Portland. "You really couldn't have had a better advocate than Michael Brennan working with the state delegation, making sure the city delegation knew what was going on the entire time and figuring out, in a time when Portland was not well liked by Gov. LePage, how to get things done and how to accomplish things," Alfond says. "And it's been remarkable to work with him. He's been a great partner, and he's delivered for the City of Portland." This election marks the third time that Brennan and Strimling faced off. Both were defeated by Chellie Pingree in the Democratic primary for Congress in 2008 and Brennan and Strimling both ran in the 2011 Portland mayoral race, with Brennan winning in a runoff. Tuesday night, Strimling earned over 50 percent of the vote, so an instant runoff was not required. Strimling earned 9,162 votes to Brennan's 6,882, according to preliminary results.